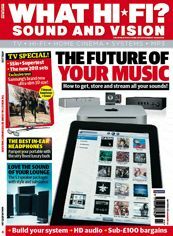 April 2011 issue on sale now | What Hi-Fi? Network streaming and downloading is the new hi-fi, so this month we've produced an in-depth guide on how to get, store and stream all your sounds. Whether you want to stream your tunes from an iPod or iPad, send your music wirelessly from one room to another or invest in high-resolution downloads, we've got the info you need. Our six-page feature explains where to buy your music online, how to store it, stream it, build a wired or wireless streaming system and examines the different digital audio formats available. On a similar theme, in our April Big Question feature three readers decide which is the best way to store and play back digital music. We also take along, hard look at the pros and cons of active vs passive 3D TV technology, with LG breaking away from the industry pack and actively backing passive 3D tech. Of course, the issue is also packed with reviews of the hottest new kit. There's a Supertest of giant 55-65in 3D TVs, a Group Test of stylish 5.1 surround speaker systems (including KEF's super-slim T105 package) and a head-to-head of luxury in-ear headphones from Shure and Grado. First Tests abound, with a detailed look at Samsung's slim and smart UE46D8000 3D/web TV, Onkyo's powerful TX-NR3008 multichannel receiver, Arcam's wireless rDAC, Panasonic's £100 DMP-BD75 Blu-ray player, the Denon AVR-3311 home cinema amp with Apple AirPlay and Pure's Contour iPod dock with internet radio. As for hi-fi, we take a lengthy listen to new foorstanding speakers from Aurousal and Tannoy, a stereo standmounter from Epos, Primare's CD32 CD player, Rotel's RT-09 wireless streamer with DAB, FM and internet radio and Yamaha's budget A-S300 stereo amplifier. We've also got a round-up of four cartridges for your turntable, and in our Temptation section we review a Resolution Cantata music system, ATC's SCM 100A active floorstanders, plus the Cyrus DAC XP+ and Mono X 300 monobloc combo. And don't forget there's still a chance to win a Sonos S5, iPad and Spotify subscription in our exclusive competition. All this and more is in the April 2011 issue of What Hi-Fi? Sound and Vision, on sale now. Don't miss it!